And so I open a new chapter. To those in the dark, SSEAYP stands for Ship for South East Asian Youth Programme, or as we Bruneians call it, Program Kapal Belia Asia Tenggara. Basically it is a annual youth programme that involves selected youth volunteers from all ASEAN countries and Japan, on board the iconic ship, M.S. Nippon Maru. It is funded and carried out by the Japanese Government. When I told people of this SMS, most couldn’t figure out what the hell I’d be doing on board. So here it is laid out for all of you to read. In short, we’d be acting as mini ambasaddors of our home countries as we stop by every SEA nation to give courtesy calls, attend receptions and participate in institutional visits. Some would get immersed into other cultures through homestays and interaction with local youths. SO YES. That’s what I’ll be up to from 21st October to 11th December. Expect fun blog posts then! For now, there’s major training and preparation to be done. I’m very excited and at the same time quite concerned of my social life. Hahaha. Work in the morning and afternoon and training at night till 10.30pm. When will I ever have the time to *gasp* blog and have my long leisurely lunches! No wonder they don’t let students participate anymore. Congrats on being selected for this year’s program..
be sure to have loads of fun… coz i definitely DID last year together with all the PYs on boards… especially with the bruneians!! yes i kmow what it is all about!! n i envy u!!!!! hahaha.. u kno i jez knew bout this programme when i started officially working in mycurrent industry.. n asked many people about it [even i asked d previous Ketua Kapal Belia whom i know].. its payah kn kna lapas for teachers to join this programme due to antah.. but sure because of ‘long-holiday’ and even if we asked for non-paid leave… (maybe the reason also nothing to do with the academic professional edvelopment whatsoever!) BORING EH!!! YEAY! You got it! Congratulations! Thanks NAZ!!! I’m definitely excited and your comment had made me even more excited. LOL. I’m so looking forward! She, MUAHAHAHAHAHAHA siuk niiiiiiii aku naik kapal and cuti and swimming and yabedabeduuuuuuu *rubbing it in*. i knew dulu sal i bumped into their blogs randomly when i was still in MD. i was like waaahhhhhhh siuknyaaaaaaaaaa belayar ani. i think thats where my love for travelling started. eh tapinya, yatah ijap ku jua! wish me luck! Tina: awu see u guys next sunday jadi ah! :D:D:D i missss u guys already!!!!!!!!!!! mcm becinta, tapi banar! Awu! Aku pun! Lakastah tani main masak-masak! LOL! tahniah. I actually tried it out last year. Actually ‘dipaksa’. My heart wasnt into it coz i just got bck frm Ozzie after soooo long. Shipping me off for 3 mths of foreign country didnt appeal to me. Hehehe. But anyways, enjoy the training and interviews etc. Bnyk org ckp siuk. I ended up only round two. btw, masaku kana interview i was asked to sing that parapam-pam song. SIRIUS!! And that’s too bad.. Cikgu inda kana suruh ah.. 😦 Oh well. Tina, ko tau.. Inda ku terclick wah masak-masak ah. Batah kan terclick.. I mean I was already thinking about what will we be cooking. HAHAHA. Let’s exchange link, shall we? you write good English. Congrats on the SSYEAP! Congrats Maurina!! I can’t wait to see you on Monday!!! Yayyy.. u’re in too!! WEee! congratulations. I guess I will be seeing you very soon then. some tips tho… the training gonna be tough, it aint a smooth sailing. lots of things to be done. but once the program starts, everything else dont matter. do check out the SPY07 site..
Itll be a crazy few months.. ull live thru it and totally enjoy yourself! 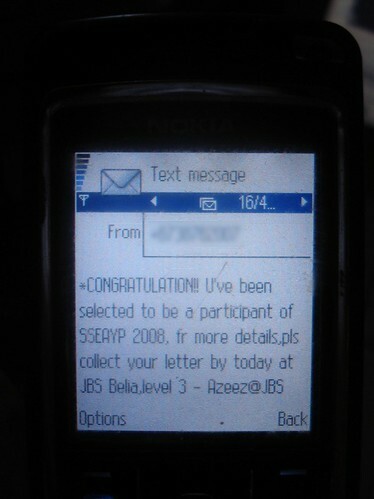 Feel free to hit us up for any advice.. alwez here to help our juniorz… welcome to the SSEAYP Family once again! Naz, woooooo! sooo excited! thanks for the tip. Thanks Chris, oh I’M A HUGE FAN OF YOU! Haha, fangirl. Anyway, used to watch you debate on TV when I was a wee girl. Thanks for the heads up, will definitely do so! chris, ada jua kau peminat, ya!!! hahaha wahseh, u wan also? I have never used the word “debate” so much in one paragraph before. War186, siapa war???? heheheheheh. eseh perfect candidate lagitu, thanks and wish me luck! Shasha, awu sha, u should try next year! Seriously! well chris… i am a HUGE fan of yours too!!! greetings from SPY 2008! here in singapore we are training hard too! hi rezal! looking forward to meeting you and all the SPYs! Hehehe. The swimming greats you should write about next, my ex was an olympic swimmer!